Basis weight control is one of the most critical applications for a valve in a paper machine. 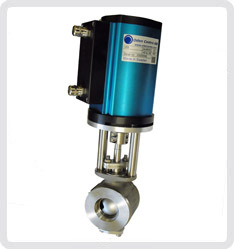 The unit consists of a reliable Hogfors ballsector control valve, complete with an Oden Controls high-resolution stepper-motor-driven backlash free rotary actuator, controlled by microprocessor, which can accurately provide an exact 4-20mA feedback signal. The Oden actuator can be supplied with the option of Analogue 4-20mA ; 0-10V ; 3-point (Digital) or Modbus 485 control.